I have been giving myself something like a midterm this week. I’ve had a few days or part-days off and instead of going nuts with everything else… I’ve been taking it easy. I’ve been using the time to catch up on sleep, laundry and spinning. Heidi sent me some beautiful alpaca roving from her honeymoon in New Zealand. Let me tell you: it is like spinning a cloud. It is so soft and dreamy I cannot wait to see what the finished yarn will be like! Because I only have three spindles, I had to finish up what I already had on the wheel. 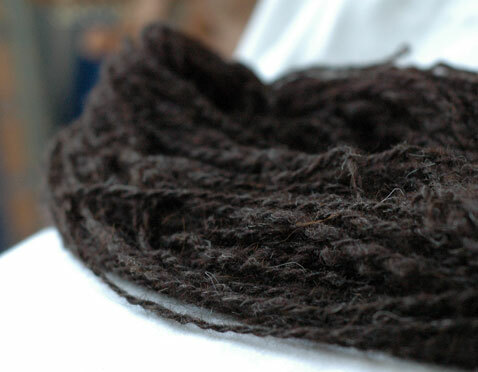 It is some brown sheeps wool that I bought over a year ago from Craftspun. I suppose you could call this a light worsted or heavy DK weight. I am really happy with the relative consistency of it. 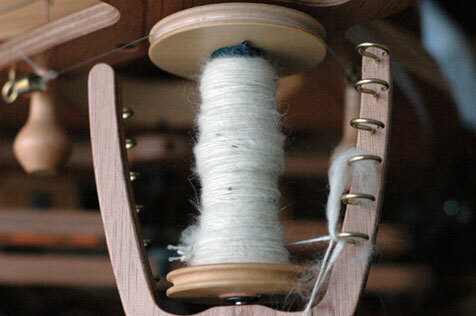 I have two large hanks plied and drying on the line as I type and they’re both about the same thickness throughout. I’m hoping to spin something similar out of the alpaca and use the two together for something like a colourwork hat. I have two FOs to show but I’m going to wait until tomorrow to take photos and talk about them properly. Happy Thursday everyone! I had the last two evenings to myself so I curled up in the blanket (sadly, uncrocheted) on the sofa and knit to my heart’s content. 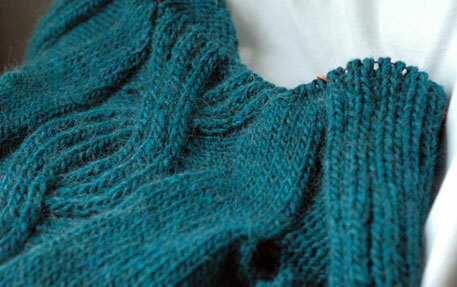 I am on the last leg of my Green Gable hoodie. Any normal person might express disappointment that they are finishing up a warm, snuggly hoodie just as the weather is starting to turn mild… but this is Ireland and it is only February. I’m sure we will have at least five more cold snaps before the weather even starts to think about staying reasonably warm. But hope springs eternal and I have been keeping all options covered. Technically I finished this on Friday night but I haven’t been able to find an edging that suits it. I think I might revert to the old reliable rolled edge. Everything else about it is great, though. It fits fine and is heavy enough to be warm but light enough to be cool, too. Like a lot of people I’ve been talking to recently, I have been feeling under the weather lately. I think I am fighting off something. I have had a headache for over a week – you know the ones that feel like you’re wearing a helmet? – and a fever that comes and goes as it pleases. I have been taking Benilyn three times daily and crocheting triangles. Some days I feel like I should save my money and just make the triangles. 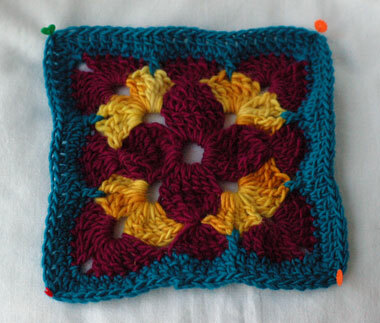 Speaking of crochet, I am teaching a beginner’s crochet class at the shop today. We have had unprecedented demand for crochet classes of all levels so stay tuned to the classes page because we plotted out a LOT more crochet classes over April, May and June. So, that book I was telling you about finally arrived. I immediately fell down that dark rabbit hole of hexagons, triangles and circles. This is the best crochet motif book I have found yet. It has colour photos throughout. 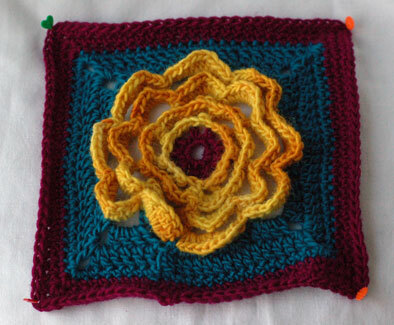 It is divided into sections – circles, hexagons, squares, triangles and ‘unusual shapes’ such as rectangles, pentagons and hearts (Pentagons are a lot of fun to work but anybody who is a fan of Norah Gaughan will know that when you start putting pentagons together, they won’t lay flat). Each motif has its own page with both written instructions (American terms) and charted instructions. The charts are very clear and easy to follow. There is also a lot of really good advice at the beginning, including different methods to work corners and to join motifs together. My favourite aspect of the book is this: it is spiral bound! The only drawback to it is that I have been working from this book as well. The squares from this book yield a uniform 4″x4″ square, whereas the squares and hexagons from Beyond the Square are more 3″x3″. I think I will need to do sit down and plan it all out. Well, it’s something I probably should do but I sort of like the idea of making lots and lots of different motifs, whatever takes my fancy, and seeing how they all fit together later. There are a few things I need to do today that I will be glad to get done. One is a sock. Another is a funding application for some concerts I am trying to organise for August. Yet another involves sewing on two measly buttons and finding an envelope. But my to-do list isn’t nearly as interesting as this: a sale! It starts at 6pm tonight, in both shops. I will be in one of them this evening so… can somebody please come and buy the Rowan 4ply soft in that delicious brown so that I can remain a pure and untempted knitter?! 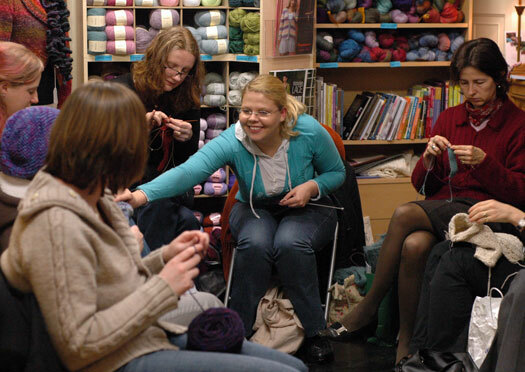 I don’t often make it along to Knit Night at This Is Knit, usually because I work the late shift in the branch in town. Usually I don’t mind too much because it takes me over an hour to get home, but every now and then it is great to catch up with everybody. We had a few newcomers last night which made for a lot of natter…. 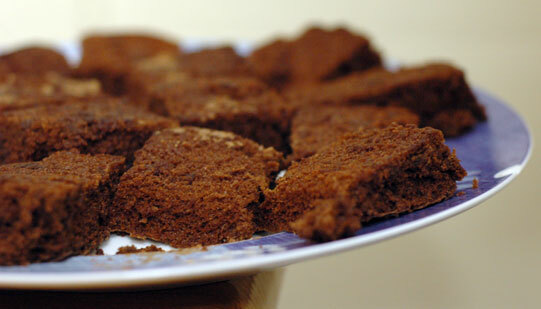 …and baked goods… brownies AND ginger cookies…. 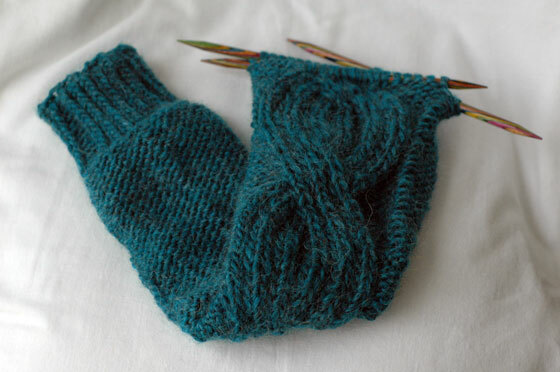 …and a bit of knitting, too. I have had to rip this sleeve out four times. I got thoroughly carried away when I thought I was on the right track and ended up with a 20″ long sleeve with no shaping – which would be totally fine if I had arms like matchsticks (hint: I don’t). Anyway, I got there in the end, which is all that matters. Now I get to knit another one. Be still, my wildly beating heart. I popped into Rubanesque for some buttons for my last magazine project (finished on Wednesday, Allah be praised!!) and picked up some matching facing to help stabilise the very curly armholes. While I was at it, I got some great old-school ribbon to stabilise the neckband of my mum’s Kidsilk Aura cardigan that I gave her for Christmas. It fits her well but the neck has started to stretch out a bit. Let me tell you, this is a very, very dangerous shop to visit. They have fabulous ribbons! It makes me want to put ribbon on everything! Not to mention the big, black, etched glass Victorian buttons they were showing me. If you’re missing some mojo these days, I highly recommend a visit to get things going again. 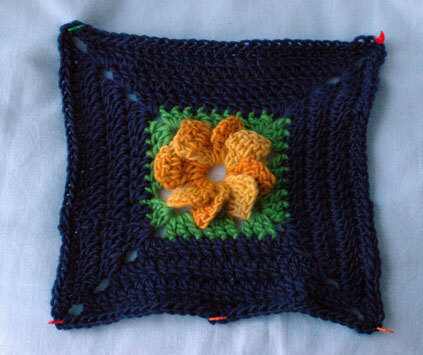 Shortly after my last post, I moved from crochet flowers to crochet blocks. This move brought with it the overwhelming desire to crochet a sampler blanket for the sofa. I have had a fluffy pink blanket on the sofa for at least a year now but Alb’s beard has a habit of shredding it up and dispersing pink fluff balls all around the house. I decided to go for the Lamb’s Pride Worsted. It comes in a brilliant range of colours, has a nice natural fibre mix and is good value for money. I have been doing one or two a night over the last few days. 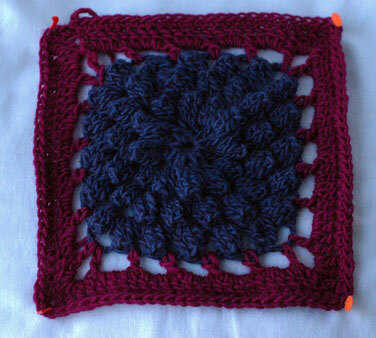 Each one takes about half an hour and ends up 4″ square. I still haven’t quite decided on how I am going to put them together. 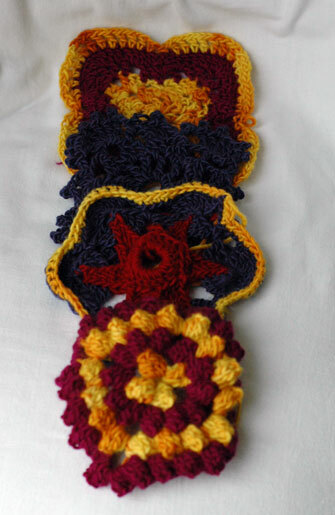 I might crochet them directly together or put a strip between each row and column. Either way, I am going to use that rich brown, Chocolate Soufflé, to tie the whole thing together. Much as I love working the blocks, I started looking around for more inspiration and found this. Hexagons! Triangles! Stars! I ordered it on Saturday night and simply cannot wait until it arrives. I have been working away on my magazine project. 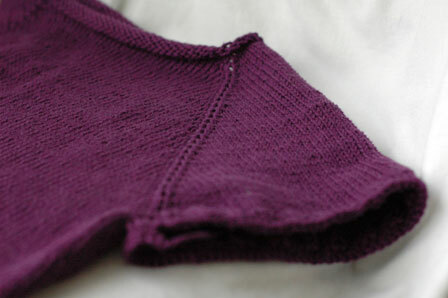 I finally figured out what I wanted to do with the neckline and the rest fell fairly easily into place. 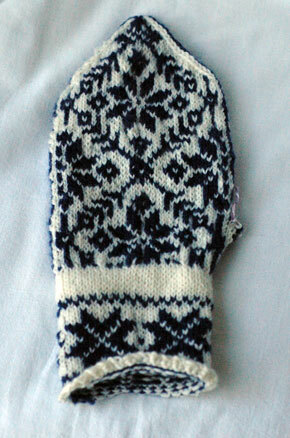 And just for the heck of it, I finished up a mitten during the week. Granted, it does need a thumb – and a mate – but I’m halfway there! My lost pair of mittens never turned up in the lost and found so I hope whoever has them is being kept toasty (and that the alpaca is fiendishly tickling their nose just like it did mine). I have been thinking a lot about future projects. I have a lot of music projects under way and they are rolling along very pleasantly. I am finishing up the last of my magazine projects for now and have been thinking about what I am going to do next. I have a large quantity of stash that I have had ear-marked for personal design projects for a long time. I think I will start working through it and just pop the patterns up here when I’m done. I have ideas for some really nice things! The last thing I have been thinking a lot about is the Guild. I have been stalling big time on this mostly because I haven’t been certain of my own situation and because I have had a hard time coming up with a plan of action. I have one now! First thing is a website. I have started pestering Alb about it and hope to get things going on it later today. It will almost certainly be nothing more than a blog with some information pages attached to it, but it’ll be a start.